Those of you who know me and Rob and who may have happened to come over to our house pre-pregnancy will remember that Tommy’s room was the only room in our house that was ALL GIRL! I had pink and light green and frills and, well, Tommy would NOT have liked it at all. So needless to say, I had quite a task ahead of me to create a space that was a little girly (because let’s be honest, the nursery is for mom – not baby) as well as peaceful. 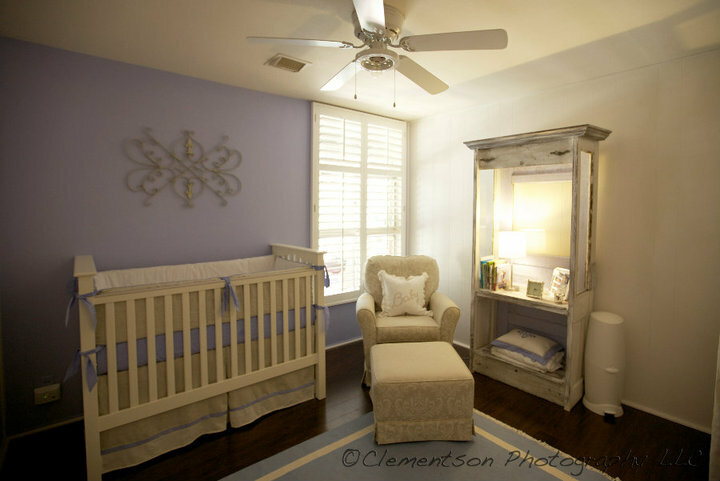 I wanted a nursery that Tommy could grow up in and that would transition well with him. This is the view right when you enter the room. His crib is from Pottery Barn Kids, the Kendall Crib. I got all of my fabrics from a fabulous baby store in Austin called Baby Coco http://www.babycoco.com and I would HIGHLY recommend them if you are looking for your fabrics. They are wonderful people and worked very well with me every step of the way. I had a very rough pregnancy. I was sick basically every day, with the exception of a couple of months; and then I just got so darn BIG that I was pretty miserable. My point is that the entire time I worked with Baby Coco they were so sweet! I didn’t have to wait long for my items to arrive at all. 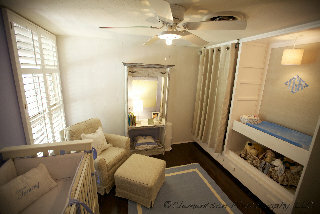 This is the alternate view of the nursery. His bedding and rug is from Serena and Lily http://www.serenaandlily.com which I absolutely love and will definitely work with again. The colors/fabrics are a soft chambray blue, white minky, and khaki linen. The hutch in the center of the photo above is actually an old door and sides that I purchased at Off My Rocker (an antique store) in San Antonio. Originally, the door was painted pink, and when I found out I was having a boy I painted it blue. The closet is my favorite part of Tommy’s room. These were old built-in closets that my dad, Rob and I gutted and made into a changing table. I absolutely love it because it was made to my height so when I change Tommy I don’t have to bend over, which sounds silly, but when you change your baby a bazillion times it makes a BIG difference! The back of the changing table is padded and draped with khaki fabric that I had monogrammed with his initials. 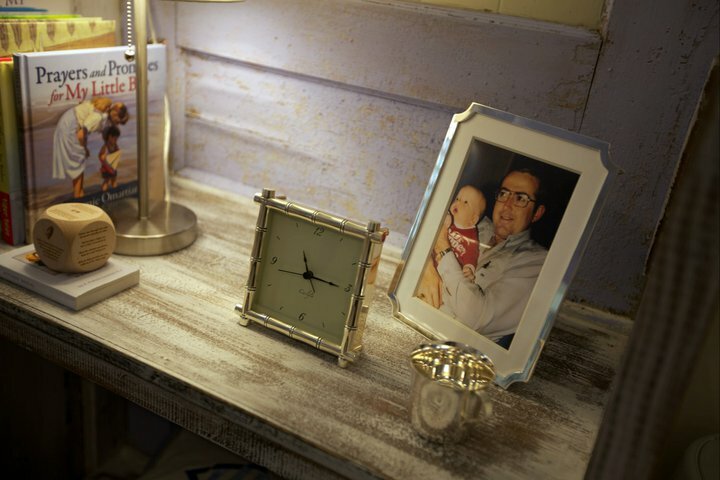 This is the only picture in Tommy’s room and it sure is special! This is Tommy’s grandfather, Tommy, or “Big T” as Rob and I like to say. His spirit is very much alive in our home and we look forward to sharing more photos and stories of his grandfather in the future. Although I never had the opportunity to meet him, I know Big T would have been so very proud of his little grandson. Rob and I believe he certainly had a hand in each and every bit of our little Tommy. We miss him dearly, but we know he has given us this precious gift of life. < Previous So, I’m going to give blogging a try.